Pocahontas was the daughter of a Native American chief in Virginia at the time when the British came to settle in the area. Her marriage to an English settler brought eight years of peace between the Indians and the British. Pocahontas's real name was Matoaka. As a child, she was also called Pocahontas, meaning "playful one," and the name stuck. Her father was Powhatan (c. 1550–1618), the chief of a group of tribes that bore his name and spoke the Native American Algonquian language. In 1607 English colonists founded Jamestown. They had been sent by the Virginia Company, a company in London that had the English king's permission to set up a colony in the area for trade with England. As a young girl, Pocahontas often played at the Jamestown fort. She became friends with some of the boys there and charmed the settlers by turning cartwheels with the boys in the Jamestown marketplace. Relations between the Native Americans and the settlers were not always smooth, but Pocahantas's friendship with the settlers may have helped keep peace. Captain John Smith (c. 1580–1631), who was the leader of the Jamestown colony until 1609, reported that Pocahantas saved his life when he was captured by Powhatan's warriors in 1608. According to Smith, whose story is not believed by all historians, Pocahantas's actions kept Smith from being killed by Powhatan's men. Saving John Smith also saved the Jamestown colony. Despite the incident with Smith, tensions between the Native Americans and the colonists in Virginia remained. In 1613, while Pocahontas was visiting the village of the Potomac Indians, she was taken prisoner by Samuel Argall, captain of a ship named Treasurer. Argall wanted to use Pocahantas as a hostage to exchange for Englishmen who were held by Powhatan's group, and for tools and supplies that the Native Americans had stolen. She was taken to Jamestown, where she was treated with respect by the governor, Sir Thomas Dale (–1619). Dale was touched by her intelligence and by her proper behavior. After being instructed in the Christian religion, she was baptized (admitted to Christianity and given a Christian name) with the name Rebecca. between them. Pocahantas's marriage to Rolfe brought eight years of peaceful relations in Virginia. 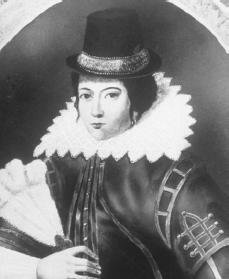 In 1616 the Virginia Company invited Pocahontas to visit England, thinking that her visit would aid the company in securing investments from the British. Rolfe, Pocahontas, her brother-in-law Tomocomo, and several Indian girls sailed to England. There Pocahontas was a great success. She was treated as a princess, entertained by the Anglican bishop of London, and introduced to England's King James I and Queen Anne. Early in 1617 Pocahontas and her party prepared to return to Virginia. However, she became ill while in the village at Gravesend. Pocahantas had developed a case of smallpox, an infectious and dangerous disease caused by a virus and leading to high fever. Pocahantas died from the disease and was buried in Gravesend Church. Her only child, Thomas Rolfe, was educated in England, and later returned to Virginia. Pocahantas was one of the first women to play an important role in what became the United States. Her friendship with the English settlers helped ensure the success of Jamestown, which became the first permanent English settlement in America. Fritz, Jean. The Double Life of Pocahontas. New York: Putnam, 1983. Holler, Anne. Pocahontas: Powhatan Peacemaker. New York: Chelsea House, 1993. Mossiker, Frances. Pocahontas: The Life and the Legend. New York: Knopf, 1976. Reprint, New York: Da Capo Press, 1996. Woodward, Grace Steele. Pocahontas. Norman: University of Oklahoma Press, 1969.
this article was helpful. i just have one question who were some of her contemporaries? how many brothers does she have and what are their nmes/ thats the info i have left after reading this article for the wax museam at my school! i need to know! anyone know another good link about her brothers?